The Ohio Players were among the top funk bands of the mid-'70s. Emerging from Dayton, Ohio in 1959, the group was originally dubbed the Ohio Untouchables, and initially comprised singer/guitarist Robert Ward, bassist Marshall "Rock" Jones, saxophonist/guitarist Clarence "Satch" Satchell, drummer Cornelius Johnson, and trumpeter/trombonist Ralph "Pee Wee" Middlebrooks. In late 1961, a relative of Ward's founded the Detroit, Michigan-based Lupine Records, and the group traveled north to the Motor City to back the Falcons on their hit "I Found a Love"; the Ohio Untouchables soon made their headlining debut with "Love Is Amazing," but when Ward subsequently exited for a solo career, the group essentially disbanded. At that point, the nucleus of Middlebrooks, Jones, and newly added guitarist Leroy "Sugarfoot" Bonner returned to Dayton; there they recruited saxophonist Andrew Noland and drummer Gary Webster, the latter a somewhat elusive figure whose true involvement in the group's history has never been definitively answered — some sources credit him as a founding Untouchable, others even as the band's early leader. In any case, by 1967, with the subsequent addition of singers Bobby Lee Fears and Dutch Robinson, the newly rechristened Ohio Players were signed as the house band for the New York City-based Compass Records, backing singer Helena Ferguson on her lone hit, "Where Is the Party," before issuing their solo debut, "Trespassin'," which hit the R&B charts in early 1968. Although the Players' trademark bottom-heavy, horn-driven sound was already blossoming, their follow-up, "It's a Cryin' Shame," flopped, and as Compass teetered on the brink of bankruptcy they exited the label. (Their early Compass sides were later packaged as First Impressions.) The Players then landed on Capitol, where 1969's "Here Today, Gone Tomorrow" was a minor hit; an LP, Observations in Time, soon followed, with covers of "Summertime" and "Over the Rainbow". In 1970 the group disbanded, however; Fears and Robinson both mounted solo careers, while the remaining members again decamped to Dayton, eventually re-forming with keyboardist and lead singer Walter "Junie" Morrison, trumpeter Bruce Napier, and trombonist Marvin Pierce. Influenced by the funk of Sly & the Family Stone, the new Ohio Players lineup made their debut with the single "Pain," issued on the small local label Rubber Town Sounds; it was soon picked up for distribution by the Detroit-based Westbound label, reaching the R&B Top 40 in late 1971. An LP, also titled Pain, appeared that same year, and was followed in 1972 by Pleasure, which launched the hit "Funky Worm", their first number-one on the R&B chart. 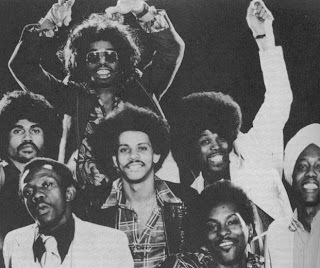 Ecstacy appeared in 1973, and after 1974's Climax, the Players signed to Mercury; the label change also heralded yet more lineup changes, with keyboardist Billy Beck replacing Morrison (who left to go solo and would later be the lead voice on the Funkadelic hit One Nation Under A Groove) and drummer Jimmy "Diamond" Williams taking over for Webster. At Mercury, the Ohio Players enjoyed their greatest success; not only did they become known for their music, but also their provocative LP covers, a tradition begun during their Westbound tenure. Their 1974 Mercury debut, Skin Tight, was their first big hit, launching the hit title track as well as "Jive Turkey." Its follow-up, Fire, remains one of the Players' best known hits, topping the pop charts on the strength of its title cut, itself a number one hit; "I Want to Be Free," one of the band's few attempts at social commentary, was also highly successful. 1975's Honey — which featured perhaps the Players' most controversial cover to date — was another hit, generating the chart-topping "Love Rollercoaster" in addition to the hits "Sweet Sticky Thing" and "Fopp." "Who'd She Coo?" from 1976's Contradiction, was the Players' last number one R&B hit; "O-H-I-O," from 1977's Angel, was their last major hit on any chart, and as the 1970s drew to a close, the band's success declined. 1979's Jass-Ay-Lay-Dee was their final Mercury effort, and upon signing to Arista, the Players returned with Everybody Up, followed by a pair of dismal releases on Boardwalk, 1981's Tenderness and 1982's Ouch! After 1984's Graduation, four years passed prior to the release of their next effort, Back; no new material was forthcoming, although various lineups continued performing live well into the following decade. Founding member "Satch" Satchell died in late 1995, while "Pee Wee" Middlebrooks died in late 1996.